mand sometimes changes significantly on a timescale of a few minutes. How much do renewables fluctuate? fact that wind does fluctuate. Figure 26.2. 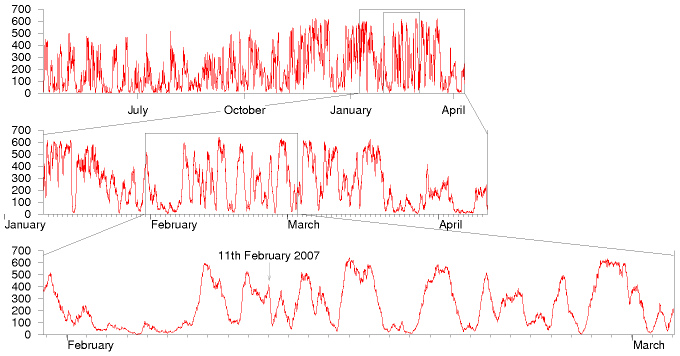 Total output, in MW, of all wind farms of the Republic of Ireland, from April 2006 to April 2007 (top), and detail from January 2007 to April 2007 (middle), and February 2007 (bottom). Peak electricity demand in Ireland is about 5000 MW. Its wind “capacity” in 2007 is 745 MW, dispersed in about 60 wind farms. Data are provided every 15 minutes by www.eirgrid.com.